Whether it’s their first time away from home or their tenth, campers are bound to get homesick sometime during the summer. It’s completely normal. (Seriously, like 96% of all campers report feeling homesick at some point.) But of course, even though missing home is natural, you still want to help your child feel at ease by reaffirming that you love them and can’t wait to see them again. We totally get it (we have kids too), which is why we’ve created a whole line of care packages that are specifically for kids at summer camp. Unlike a lot of our other gifts, most of our summer camp care packages aren’t brimming with sweet candies and crunchy snacks. That’s because nine times out of ten, camps these days don’t encourage sending outside foods…and for good reason. If you think a little homesickness might scar your kid, just think (but not too hard) about what a bear attracted to the sweet smell of chocolate chip cookies might do. Exactly. But what’s more is that a lot of children have really bad food allergies and not knowingly, you might send something that aggravates their bunkmate’s symptoms. So the first thing to do before you settle on a specific gift is to check the camp’s rules and find out what you’re allowed to send. As for what is in our gifts, well, we’ve made them really fun. Call us nostalgic (or overly sentimental), but we believe camp is and always will be about making friends, so we filled our summer camp care packages with toys, games, and activities that are perfect for both boys and girls. That way, no matter what camp they’re attending, whom they befriend, or what sparks their interest, there’s a gift in our collection that’s perfect for your child. Take for example, our Activities, Games, and Puzzles Care package. As the name implies, it’s filled with quite a fabulous assortment of entertaining items so that other campers won’t be left out of the fun! With books of puzzles, playing cards, and portable games, your child’s cabin is about to become THE place to be. 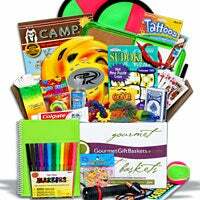 And what’s more, this care package is perfect for when your camper needs a little time to themselves by supplying them with toys, such as art supplies, which are entertaining not only for a group, but one person too. Another stellar product that we’re super excited about is our Deluxe Kids Sports Care Package. It’s totally perfect for kids who don’t get tired easily. (The camp counselors (and other parents) will be writing you thank you notes.) Loaded with a bunch of different toys, including playground balls, this care package allows for campers to easily create hundreds of different games of various difficulties, which is really appealing when there’s a group of different aged kids (i.e. most summer camp programs). And of course, there are some camps out there that allow you to send food! The best camp care packages offer things that can be shared, and when it comes to food, we’ve got plenty of ideas for you to choose from, including popcorn! Crisp, bright, and totally shareable, our yummy, handcrafted popcorn is always a hit! Plus, each of our popcorn products has between 2 and 9 deliciously unique flavors, offering something for even the pickiest of campers! If you’d like to know more about our care packages (or, really, any of our products), just give our super friendly customer service department a buzz. And, as always, thank you so much for your business!